In New Jersey, where the prevailing property tax rate is 2.67 percent, the opportunity to live in a lavish condominium offering less than half that at 1.1 percent for 10 years, with gradual increases thereafter, seems like a mirage. However, for buyers at K. Hovnanian Homes’ Nine on the Hudson, the 13-story, 278-home development with resort-like amenities along New Jersey’s Gold Coast, that mirage is a reality. 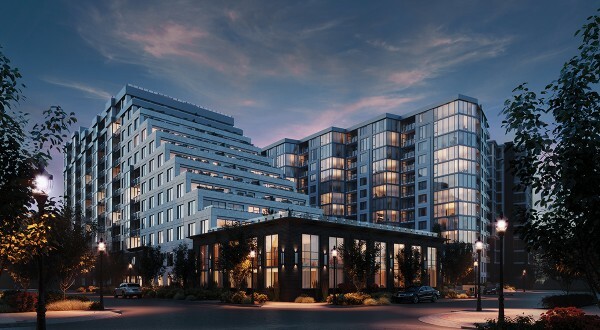 As the only development in New Jersey offering this attractive tax abatement, Nine on the Hudson is setting the standard for attainable luxury in an expensive area that continues to evolve. Located along the Hudson River Waterfront in the Port Imperial neighborhood of West New York, Nine on the Hudson exemplifies a vibrant and enviable living experience, where breathtaking views of the New York City skyline and amenities are at residents’ fingertips. With more than 31,655 square feet of outdoor and indoor amenity space, residents will be treated to a five-star experience that also includes a 24/7 concierge. A communal rooftop lounge boasting private cabanas, fire-pits and outdoor heaters will offer the ideal setting to gaze at picturesque views of the Hudson River and Manhattan skyline on a crisp fall evening. A communal rooftop lounge boasting private cabanas, fire-pits and outdoor heaters will offer the ideal setting to gaze at picturesque views of the Hudson River and Manhattan on a crisp fall evening. During the warmer months, a thoughtfully landscaped green terrace will lead to an infinity edge pool and hot-tub overlooking New York City. What’s more, barbecue grills, wet-bar, billiard table and large screen televisions assist in providing endless options for entertaining. Adding to the oasis-style experience at Nine on the Hudson is the state-of-the-art, two-story fitness center, with direct access to an expansive 2,000-square-foot, Zen-inspired yoga room to achieve ultimate relaxation. Residences range in size from 773-square-foot, one-bedroom homes to 2,580-square-foot, three-bedroom homes with pricing ranging from the $600,000 range to the $6 million range. For more information, call (844) 230-7459. See khov.com/Nine for full details. All prices are base prices, subject to availability, and subject to change without notice. Hovnanian Enterprises Inc., founded in 1959 by Kevork S. Hovnanian, is headquartered in Red Bank. The company is one of the nation’s largest homebuilders with operations in Arizona, California, Delaware, Florida, Georgia, Illinois, Maryland, New Jersey, Ohio, Pennsylvania, South Carolina, Texas, Virginia, Washington, D.C. and West Virginia. The company’s homes are marketed and sold under the trade names K. Hovnanian Homes, Brighton Homes and Parkwood Builders. As the developer of K. Hovnanian’s Four Seasons communities, the company also is one of the nation’s largest builders of active lifestyle communities. Additional information on Hovnanian Enterprises Inc., including a summary investment profile and the company’s 2016 annual report, can be accessed through the “Investor Relations” section of the Hovnanian Enterprises’ website at khov.com. For more news about new construction projects, including amenities, builders’ incentives and luxury features, click here.